Hutchinson, 1957, Hardback in Dust Wrapper. Condition: Good — in Poor Dust Wrapper. Unlaminated dust wrapper a little edgeworn and faded with loss at the head of the spine and several short tears. Price Clipped. Leans. Offset to the blanks. Text complete, clean and tight but a little age-tanned. A Translation of 'Ne khlebom edinym', first published ini 'Novy mir' in 1956. From the cover: “This is one of the most vital and significant documents of our time — a Russian novel which, although its first appearance was made only last autumn, is already sure of its place in history. It was first published in Russia during August, September and October 1956 in three consecutive issues of the Moscow literary periodical Novy Mir. 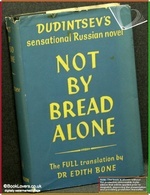 Before the third instalment had appeared, both the book and its author had become familiar names in millions of Russian households, while heated arguments were conducted over the text by officials and Party members throughout the U. S. S. R. There were two principal reasons for its astonishing reception. The first is that Dudintsev tells a human story as only the Old Russian masters in the days before the Revolution could tell a human story. The second is that Dudintsev, in terms of the storyteller’s art, goes much farther than Khrushchev did in striking out against the tyranny which Stalin and his bureaucrats exercised over the human spirit. 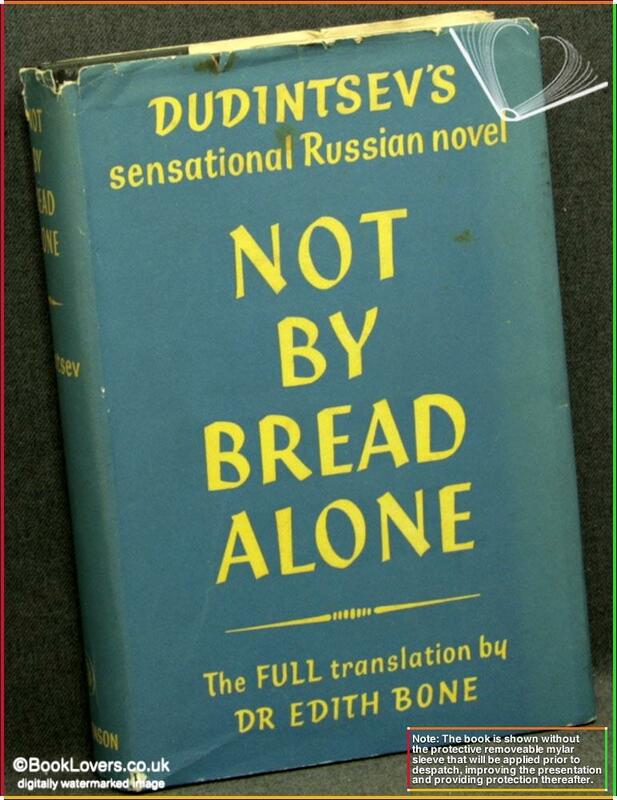 The hunger of the Russians for freedom found startling expression in this book, and its success has presented the rulers of the U. S. S. R. with a multitude of problems. University students took it to their hearts and at crowded meetings cried out against the Great Lies with which they had hitherto been fed. In humble homes from the Arctic to the Caspian, from the bounds of Europe to the Far Eastern deserts, tattered copies of the periodical in which it first appeared are a precious and secret possession. It would be impossible to over-emphasize the importance of this novel — either for the Russians, desperately anxious to break through into a freer life; or for ourselves, for whom an understanding of the Russians is literally a matter of life and death. Size: 8" x 5¼". Black boards with Gilt titling to the Spine. [VI] 446  pages.